Today the D7 irrigation canal or better known as Adakilamodai canal, carries an uninterrupted flow of water to feeder tanks from the Giant's Tank in the Mannar rice bowl. Earlier the poorly done renovations were not helping this three-and-a-half-kilometre long canal to carry water to its full capacity. The main reason was that the canal was abandoned for more than twenty years due to terrorist threats just like all the other irrigation canals and tanks in the rice bowl of Sri Lanka. 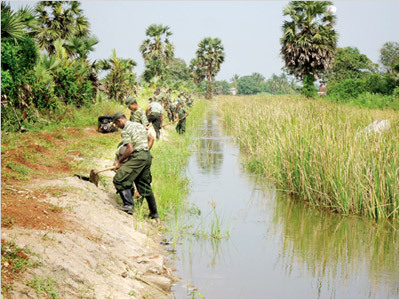 After many failed attempts to repair it by the local authorities and village farmer communities, the Department of Irrigation requested Sri Lanka Army's 542 brigade, to assist in renovating this main canal, to provide adequate water to the paddy fields of the rice bowl. Around the Giant's Tank the terrain is dotted with small tanks and webbed with irrigation canals. With terrorist attacks, a major part of these irrigation systems were abandoned and paddy lands were scattered with landmines. As the people resettled, the Government authorities, with the assistance of the Sri Lanka Army, slowly but steadily made every inch of this fertile land free of danger. One by one the irrigation canals were cleared, repaired and restored enabling a steady flow of water from the Giant's Tank to the rice fields. Soldiers are experts in the art of repairing and rebuilding as they are the sons of the average villager. In the Vavuniya-Mannar region, under the instructions of Commander of the Security Forces Headquarters Major General Boniface Perera, each village has formed a collective of prominent senior villagers and ground level government administrative officers to be in contact with the closest Army camp at all times, be it for the help in development work or a disaster. Army personnel deployed in Mannar conduct various community service projects to ease the life of these resettled communities. 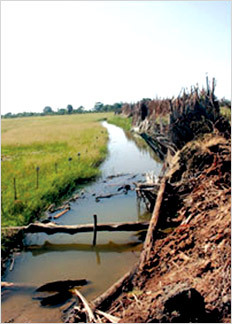 In this background the 542 brigade under Brigadier Mervin Perera undertook the task of repairing the 3.5-kilometre long canal amidst the other community based projects the Brigade was responsible for. In the area of responsibility coming under Brgd. Perera, this is the main grievance the farmer community was facing. Though one may think that the responsibility of the Sri Lankan Armed Forces ended on May 19, 2009 by eliminating terrorism from the motherland, it certainly did not. These true sons of the soil never gave up and still continue their service to the nation. Army personnel are involved in a large number of development works such as agriculture, building roads and helping the resettled communities. Soldiers commenced working from January this year on the land that their brethren saved from the iron fist of the LTTE. They help the farmers to cultivate the land that was once soaked with blood, sweat and tears of their own peers. This most fertile land of our country was totally cleared by our troops in June 2008. It was initiated by the 58 Division under the command of Brigadier Shavendra Silva (now Major General). By end of September 2007, Sri Lanka Army decided to launch the 58 Division to liberate the Northwestern coastal belt above Mannar starting from the `Rice Bowl' and Brigadier Shavendra Silva was appointed as its General Officer Commanding (GOC). A web of irrigation canals spread across the plain. Even the slightest movement of an object was clearly visible for several miles! A major part of the battle was carried out in the darkness of the night. Even amidst heavy rain, dipping themselves in muddy water, while their colleagues on either side dying or getting injured and knowing that the terrain they are to cross was dotted with lethal anti personal mines, soldiers never gave up and fought hard. Having studied the ground situation and the strength of the enemy, Brigadier Shavendra Silva started the advancement of the Division on three fronts - one moving forward from Thirukethiswaran towards Manthota, the second towards Palakkuli and the last from Uyilankulama towards Parappakandal. By November, the troops strongly felt the enemy's weak responses. By the end of November they broke the first enemy defence line including Palakkuli, Manthota and part of Parappakandal general area. But the troops engaged in 'Operation Rice Bowl' faced the biggest obstacle in the months of March and April due to the unexpected rainy weather. The entire rice bowl went under water during the rainy season, restricting movement of the troops. With the rains, the LTTE expected the Army to relax their momentum but with determination the valiant troops moved ahead. LTTE was stoutly resisting troop movement and kept on holding onto their fortified camps, bunkers, villages and tank bunds that were strategically important to them. Troops had to cross several kilometres of open land and at different points they used different tactics. At times they moved in between two enemy lines and destroyed both at once. The mission would be either an assault or moving towards the enemy by digging ditches or fixing haversack covers during the night and launching their attack in the wee hours of the following day. The entire Army defence line was steadily progressing towards the general areas of Adampan, Pikkulam, Parappakandal and Karukkakulam breaking their second defence line. Signifying their accelerated progress, troops captured Adampan town on May 9. Progressing from Adampan troops next captured Mullikandal, Minnaniranchan and Marattikannadi villages by June 24. While progressing towards Minnukulam, Nethunkandal, Periyakulam and Alankulam troops breached the LTTE's third and last defence line in the `Rice Bowl' area. In the middle of the fighting to regain the Vedithalathivu area Sri Lanka Army's 57 Division exerted severe pressure on the LTTE. The troops attached to the 58 Division under the command of Brigadier Shavendra Silva and 57 Division under the command of Major General Jagath Dias linked together in the South West of Periyamadu Village. This broke the main supply line of the LTTE chasing them towards the North. Breaching the stiff resistance troops reached Nethunkandal and Minnukulam and advancing further captured two villages, Maraththikandal and Chalampan which were strategically important to the enemy. With this victory troops successfully blocked the main supply routes of the LTTE from Vedithalathivu to the `Rice Bowl'. Capturing over 123 square kilometres of flat land and about 23 square kilometres area of the Giants' tank soldiers of the Sri Lanka Army regained the entire `Rice Bowl' eliminating enemy strongholds. According to statistics available with the 58 Division immediately after this liberation, nearly 2,058 LTTE cadres were reported killed while 1,408 were injured in addition to the large stock of weapons discovered by the Army. This is the first time in the two and half decade long history of the North and the East conflict the Security Forces had been able to fully liberate the 'Rice Bowl'. And it is one of the rarest experiences they had where the troops crossed such a huge open terrain within a span of nearly nine months, facing stiff resistance from the LTTE. Today on this land liberated with such dedication and commitment paddy cultivation flourishes. Adakilamodai canal irrigates 5,368 acres of paddy land. Counting all of its branches this canal is 4.5 km long. "This irrigation canal is parallel to the Murunkan-Mannar road and it carries water to the feeder tanks. Thus it was a main water supply line for the farmers," said Brigadier Perera. Accordingly the irrigation department has valued the repair at nearly Rs. 4.5 million. "Our Soldiers are skilful with tools but they needed technical assistance to repair an irrigation canal. And the Irrigation Department gave technical advice to clear the canal properly," he said. There have been a lot of weeds growing on the banks of the canal. The soldiers removed the weeds, smoothed the banks of the canal and cut the branches of large trees overhanging the canal. "The Irrigation Department wanted to have neat work since this canal flows close to a main road and to make it an eye catching scenery too," Brig. Perera said. This is not the only assistance the troops extend towards the community. They are engaged in disaster situations like flooding during heavy rains. When the tanks overflow during the Southwest monsoon Army hurries to the scene as the entire rice bowl gets flooded. During the months of December and January next year, troops of 542 Brigade will be heavily loaded with civilian rescue operations. The `Rice Bowl' covers 123 square kilometres and is dotted with approximately 153 major and minor tanks and a web of irrigation canals spread across the plain. 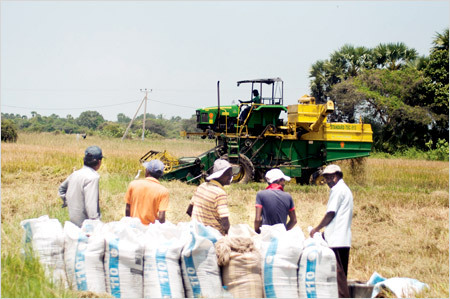 The government has taken steps towards a massive agricultural development drive in the Mannar district. A government sponsored rapid irrigation system rebuilding program is in progress in Mannar to ease the problems of the farming community affected by the scarcity of water for cultivation and other purposes. There are around 25 farmer associations whose paddy lands benefit from the waters of the canal. The 542 Brigade will continue maintenance until the end of 2013 and hand it over to the farmer community. Hopefully by then they would have rebounced back to their glorious past.